This PDF 1.5 document has been generated by Microsoft® Word 2010, and has been sent on pdf-archive.com on 10/09/2017 at 17:24, from IP address 103.84.x.x. The current document download page has been viewed 174 times. File size: 987 KB (8 pages). values of resultant new corrected images. 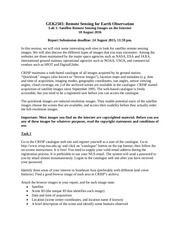 images with resolution same or higher than the reference image. sensed imagery often contains geometric distortions. the precise mathematical models for geometric correction. information about sensor used for acquisition process  . process between two images (raw and reference) images. operation known as an intensity interpolation   . of study through the research works. Fig. 4 shows a schematic diagram of research algorithm. polynomial as the data do not contain elevation information. and scaling  , as shown in (1). accuracy of the resultant geometric correction model. Data Analysis System (ERDAS) Imagine Software 2015.
resolution and raw LANDSAT8 with (15.0) meter resolution. IKONOS satellite image with different pixel resolution. generated IKONOS image of pixel resolution 15.0 m.
image resolution nearly the same of the reference image. cause change in feature position. position, so when select these feature it’s not sharply defined. Sciences &amp; Aviation Technology (ASAT-13), 2009. Data Fusion, vol. 2, pp. 3-35, 2011. Remote Sensing, vol. 25, pp. 1893-1924, 2004.
International Journal for Scientific Research and Development &quot;, vol. Vol. 4, , p. 4, 2016.
resolution SAR and optical satellite imagery in urban areas,&quot; 2009. Photogrammetric Engineering &amp; Remote Sensing, vol. 71, pp. and Spatial Information Sciences, 2002. McGraw-Hill Higher Education Boston, 2006.
International Research Journal of Engineering and Technology vol. Engineering Department, Military Technical College, Cairo, Egypt in 2010. This file has been shared by a user of PDF Archive. Document ID: 00671555.